LUCENA CITY – One of the largest and most diversified corporations in the country has proposed several big-ticket development projects in Quezon province, particularly in Pagbilao and Sariaya. Ramon Ang, president and chief operating officer of San Miguel Corp. (SMC), has written Gov.David Suarez with the list of projects and requested the latter to facilitate the favourable endorsement and approval by the Sang. Panglalawigan. The proposed projects to be established in Pagbilao are the following: 2.0M MTPY cement plant with Co-gen plant, up to 1.200 megawatts CFB power plant (clean coal technology), deep seaport, all with the proposed location in Bgy. Ibabang Polo; dressing plant, slaughterhouse, ready-to-eat (RTE) plant to be located in Bgy. Ilayang Palsabangon; logistics center and quarry to be located in Bgy. Ilayang or Ibabang Palsabangon and Bgy. Ilayang Bagumbungan. Those to be set up in Sariaya are the following: tank farm, brewery, feed mill and cement grinding plant, pier and port facilities all proposed to be located in Bgy. Castañas or Bgy. San Roque Guisguis. There will also be proposed access road and site development and relocation/resettlement sites for target areas in both towns. 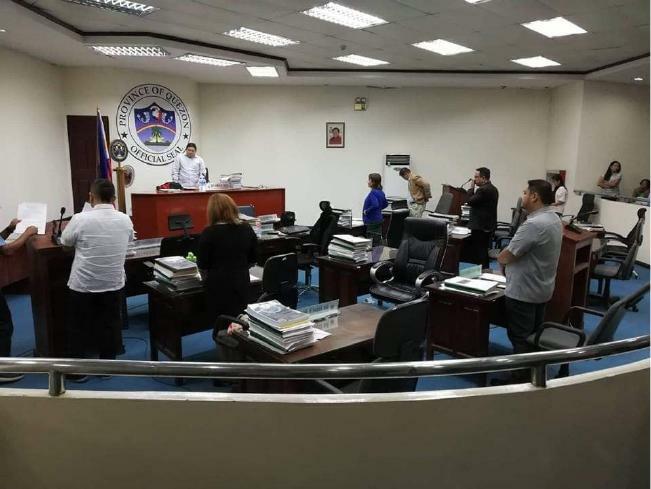 The Sangguniang Panglalawigan on Dec. 17 has approved Resolution No. 2018-847 “expressing the full support of the provincial government of Quezon by approving the list of proposed projects of San Miguel Corp. in the province and interposing no objection to its implementation and operation. The resolution was certified as true and correct by SP secretary Francis Xavier Sia, attested to be duly adopted by vice governor and SP presiding officer Samuel Nantes and approved and signed by Suarez. The joint committees on Laws, Rules and Regulation and Ways and Means both chaired by Talabong and board member Isaias Ubana II have recommended to the plenary of the SP to approve the SMC projects in Pagbilao and Sariaya. Other members of the joint committees who signed the recommendation included board members Donaldo Suarez, Vincent Dominic Reyes, Claro Talaga Jr. and Raquel Mendoza. Earlier, on Nov. 19, Gov. Suarez wrote to the SP members thru the SP presiding officer to request for the passage of a resolution, certified as ‘urgent’ which approves the list of SMC projects.